The first thing that came to mind when I fired up Star Fox 64 3D for the Nintendo 3DS was the first time I played the original Star Fox 64 at a friend's house way back in '97. While reflecting on how weird that is and suddenly feeling unusually old, I wondered if a decade later, the fun, fast-paced, button spamming action of the original title could hold up in Star Fox 64 3D. And I can't say much more than yes, yes it does, and does so very nicely. From the first mission to rescue Corneria from the invading forces of Andross, to dog-fighting against the rival Star Wolf team in the skies of planet Venom, all the magnificence of the original Star Fox 64 is back in full form with the significant graphical upgrade and the depth-filled 3D being extra icing on the cake. 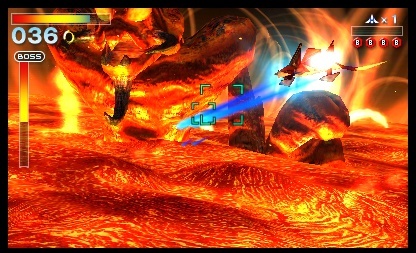 Even while after a decade the rest of the Star Fox team still can't seem to shoot down anything without help (especially that annoying amphibian Slippy), there's not much in Star Fox 64 3D that detracts from the nostalgia-filled glory of the original. For those of you who missed out, the original Star Fox 64 has the player star as Fox McCloud, legendary pilot and leader of the mercenary Star Fox Team. It tasks you to use your high-tech Arwing fighter to shoot, bomb and barrel-roll your way through the forces of evil genius Andross in order to stop his conquest of the Lylat system. 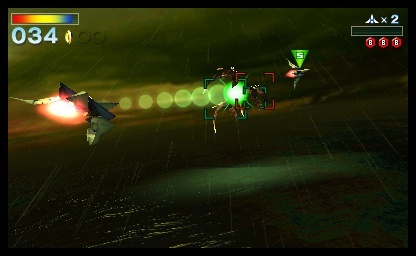 Star Fox 64 3D does an excellent job of keeping the well-paced action of the original. Most of the game is a straight-up rail shooter, as you laser anything and everything that shows up in front of your path. Occasionally you're given free rein to fully fly around in what the game would call 'all-range mode', turning some missions or boss battles into a sort of pseudo-flight simulator. These parts were my favorite, as it broke up the linearity of some levels and let me test my piloting ability in a more third dimensional environment. I also liked how it threw in the need for a little strategy in the arcade-style gameplay, as enemies don't come at you with all guns blazing, and instead are more apt to dodge and weave around your attacks. Missions also vary from one to the next. Sometimes they'll have you flying through space, the corona of a sun or occasionally sending you into combat in a tank or a submarine- there's very little repetition between stages and you're not always facing the same types of enemies twice. It gives Star Fox 64 3D some good replayability, especially since there's some stages that can only be reached through figuring out some hidden objectives. There's also a unique boss fight towards the end of each stage that often requires you to think beyond "shooting the giant glowing square" in order to take them down. All of it leads up to Andross himself, who, as all evil geniuses are wont to do, tries to destroy you while piloting a giant robot monkey head designed in his own image. This last battle was just as much a freaky but cool experience on the 3DS as it was back on the original Nintendo 64. There are a few little things that may prevent someone from experiencing total nostalgic joy however; one being the claustrophobic feeling that comes with playing on 3DS' small display. There were a few times where I found it a bit of a struggle to see where and who I was shooting at, with my high-tech Arwing feeling like it was taking up almost an entire quarter of the screen. Thankfully the camera is a bit more flexible in some areas of the game where you're engaging enemies in the 'all-range mode' environments (as there's more maneuverable flight allowed than just following a set path), but other times it adds on a thin layer of frustration when you think you've dodged a super weapon's doom ray only to realize you've just banked right into it. It's a small drawback, sure, but with all the parts of the game that were upgraded for the 3DS release, I figured a slightly revamped camera system would've been in there somewhere. Another idea that felt like it could've been worked out a little more are the optional "gyro" controls, which use the built-in motion sensors of the 3DS and lets you pilot your ship just by tilting the 3DS around rather than using the circle pad. By itself I didn't have too much of a problem using them (I preferred the regular controls), but with the 3D display turned on to max, my vision ended up going blurry trying to tilt my head along with the 3DS to pull off aerial maneuvers. Since the 3D part of the 3DS' display requires one to look at it straight on to get the full effect, angling it left or right in Star Fox to move your ship around causes a rippling 'double vision' effect that might give some a headache, and you may find it better to have one or the other on while playing. And given how nicely detailed the graphics and 3D are, personally I opted to keep the "gyro" turned off. Multiplayer wise, there's a trio of game modes allowing you to battle against up to three of your friends over who can rack up the most points or outlast the clock, though sadly this is through Download Play and not over WiFi. If you're lacking in the social department (like yours truly) there is the option to take on the surprisingly challenging AI. I found that even on the lowest difficulty setting, the teammates who were barely useful during the main campaign turned into merciless ace pilots who terminated me with extreme prejudice. Sometimes they'd forget it was a free-for-all and gang up on me if I was a point or two in the lead, and no amount of somersaulting could save me from the hailstorm of lasers. These matches against the AI were fierce but short, and a great quick way to kill some time, though I did like how the sheer tenacity of the AI kept me coming back for just one more match. Nothing was more satisfying than taking revenge against Slippy by firing a well-aimed bomb right into his smug face, and seeing how he liked being a rapidly expanding cloud of atoms for a change. Overall, I'd say Star Fox 64 3D is a fantastic remake of the original game- it brings back all the fun of the classic Nintendo 64 title, gives it a shiny makeover and makes good use of the Nintendo 3DS. Despite the quirks of the small screen size and the gyro controls, I'd definitely recommend it, especially if you missed out on Star Fox 64 the first time around. Bottom Line: A brilliant remake, Star Fox 64 3D sports all the fun and fast-paced action of the original with an excellent visual redesign and only a few minor drawbacks. Recommendation: If you missed out on Star Fox 64 the first time around, or are looking to relive some of the Star Fox Team's glory days, you can't go wrong with Star Fox 64 3D. Paul Goodman is wishing Peppy would learn the difference between a barrel roll and an aileron roll.